Mohamed Salah scored his 50th Liverpool goal as Jurgen Klopp’s men eased to a 4-0 home win over Red Star Belgrade on Wednesday to get their Champions League campaign back on track by going top of Group C.
But the hosts’ first real chance resulted in the opener. 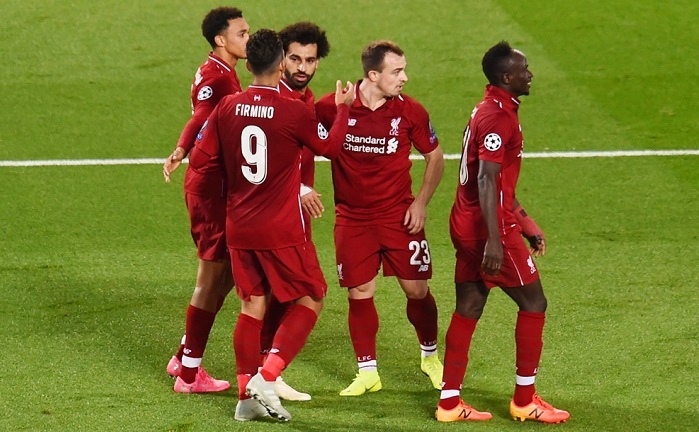 Xherdan Shaqiri dissected the Red Star defence and the advancing Andrew Robertson pulled the ball back to Firmino, whose strike deflected beyond goalkeeper Milan Borjan. Borjan’s stunning stop from a second Liverpool spot-kick briefly kept Mane at bay after El Fardou Ben was penalised for handball, but the winger soon prodded into the net to cap a positive evening for Liverpool. While Klopp’s men have so far kept pace in the Premier League this season, they have sometimes lacked the dynamism in the final third that made them such a thrilling watch last term. Klopp’s men were back to their best at Anfield. After a slow start, the Reds played some glorious, flowing football. Shaqiri pulled the strings, Robertson flew forward and the trio of Firmino, Mane and Salah tore holes in the defence with their movement. Given the form of Liverpool’s front three last season, many onlookers wondered quite where new signing Shaqiri would fit into this side. They need not have worried. Klopp has made room for Shaqiri on the right, moving Salah central, and he has delivered, creating the winner at Huddersfield Town and starring again on Wednesday. Running hard without the ball and working magic with it, the midfielder already looks to be a key man. It should hardly come as a surprise on just Fabinho’s second start in Liverpool colours, but he looked early on like a player who has not played a great deal of football of late. The midfielder was twice caught dallying on the ball and should have gone into the book for a poor challenge. The former Monaco star improved as the game wore on, but Liverpool will hope for more from the new man.